It is with a heavy bitter sweetness in our hearts, that we would like to thank you for your time at Duke University. I say “our” and “we” because I am speaking on behalf of some of your biggest fans, along with myself. For these past four years at Duke, we have all seen and followed you, as you transformed into the player and person you are today. It has been a pleasure to watch you wear that number 3 jersey out on the court. You always gave so much heart and passion into the game and that was obvious. Even when unfortunate mishaps occurred throughout your college career, we all still sought out the good in you and your intentions. With tonight being your senior night, I would simply like to say, thank you for your time. We as Duke fans, really appreciate your selflessness and class you brought to Duke’s basketball team. As appreciation, I would like to reflect back on some favorite memories over the years. Starting out as the 2014 McDonald’s All-American Dunk king. 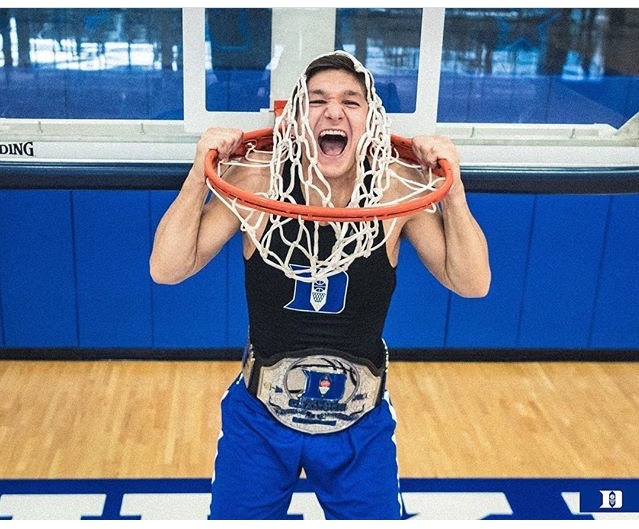 Grayson Allen was the name that made a lot of headlines coming into his first college basketball season, after being crowned the winner of the annual dunk contest. There were some other familiar faces along with Allen in attendance such as, Justise Winslow, Jahlil Okafor, Tyus Jones, and current UNC senior, Theo Pinson, to name a few. Also in attendance as a judge was Duke alum, Jay Williams. Grayson easily stole the show when he decided to jump straight over 6’11 teammate, Jahlil Okafor (and he didn’t even push off his shoulders, just straight BOUNCE). Not to mention, this dunk was a follow up to Pinson’s dunk over Jay Williams. So what does Grayson do? He throws on a Jay Williams jersey to spice things up a bit, and brings out Okafor for the contest winner. A time when we as Duke fans all knew, everyone better watch out for Grayson Allen. Here's the video, in case you forgot how awesome this moment was. Grayson’s freshman year was nothing short of amazing, although his start was a little dormant. It was the year that Duke brought home their fifth NCAA championship title. 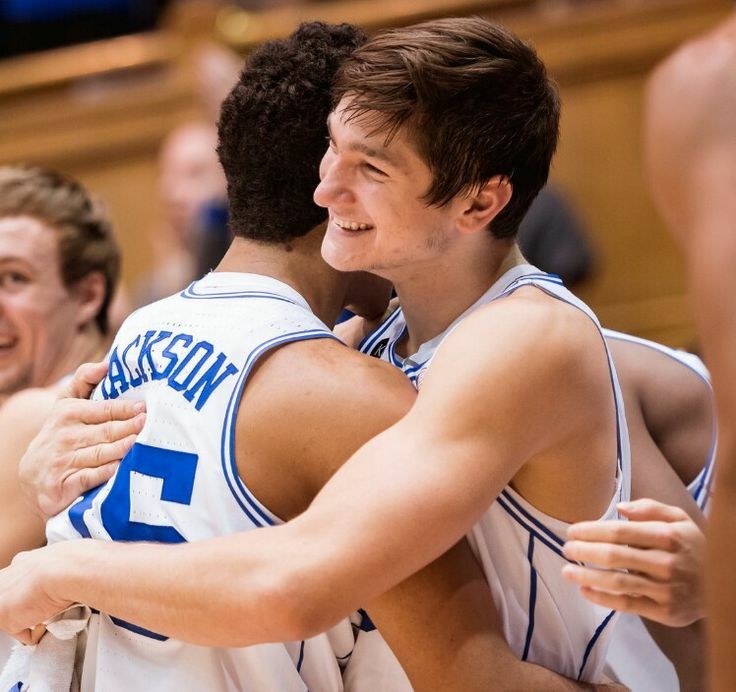 Grayson Allen, or as senior Quinn Cook liked to refer to him, “Deebo”, became known as a Duke super star. It wasn’t until a month into ACC play when Rasheed Sulaimon’s dismissal from the team, that Grayson got some playing time. His time on the court was still limited, which Allen wasn’t too fond of. Apparently, he had many heart-to-heart conversations with Coach Mike Krzyzewski and John Scheyer about this topic, on which they kept telling him “Your time is not next year. Your time is now.” And boy were they right. “You could see his confidence starting to grow” according to Scheyer as Allen went on to score a career high of 27 points in a big win over Wake Forest. And on to the ACC tournament, defeating NC State with the help of G scoring 11 points. He went into the 2015 NCAA tournament averaging only 4 PPG, but his confidence was getting stronger each game, and Coach K recognized the energy and intensity Allen could bring to the team. Leading up to the championship game, G had helped bring the team up 50-31 against Michigan State in the final four, with a tomahawk dunk after he rebounded his own missed shot early into the second half. That was just a teaser for the winning championship game. 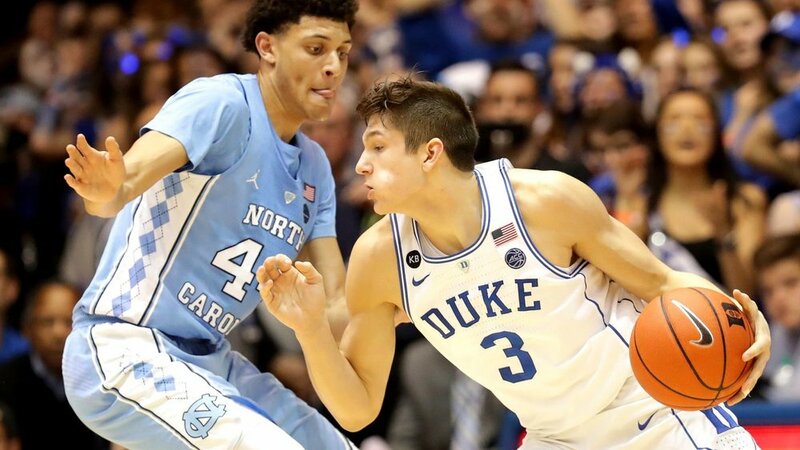 It was a few days later that Duke nation witnessed one of the greatest moments in Duke basketball history, with major help from non-other than the rising star freshman himself, Grayson Allen. They brought home their fifth National title to hang in Cameron Indoor. I remember these moments like they were just yesterday. Grayson scored 16 points off the bench and made some intense plays to help Duke get back on top from 9 points down. "We were kind of in dead water. We were nine points down and Grayson just put us on his back." Coach K stated in a post-game interview. The freshman was crowded with interviewers and cameras after the game, so much that he couldn’t even get to his seat in the locker room. 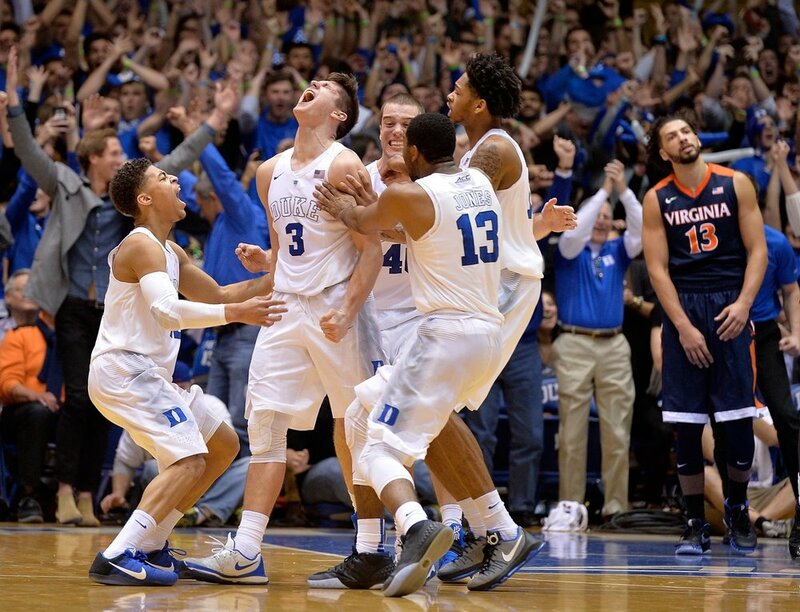 It was in those moments that the team realized they had just won the 2015 NCAA title, with the help of one of the most loved (and hated by every opposing team), Grayson Allen. Grayson's sophomore year he was known for being one of, if not the best, player on the team. We all came to love him more and more as the season went on. The accomplishments of Allen in his sophomore career are unlimited. He scored 779 points throughout the season and became ranked Duke's seventh on the single-season scoring list, and also beat the record for second-highest points scored by a sophomore in history. He also made 211 free throws to tie for sixth on Duke's single-season chart. Allen picked up the All-American honor as a sophomore, he was one of 10 students athletes to receive this award. On March 3rd 2016, Allen was named to the All-American academic team for the second consecutive season. He is just the sixth Duke student athlete to earn on court All-American honors and Academic All-America recognition, in the same season. He was also named first team All-ACC selection (by the ACSMA), giving Duke a first team, all league member for the 19th time in the last 20 seasons. He was the first player to return to Duke after earning All-America honors in the previous season, since J.J. Redick and Sheldon Williams in 2005-06 (according to goduke.com). We can’t forget about the time he scored 23 points and grabbed seven rebounds against UNC, defeating the Tar Heels in the Dean Dome. I vividly remember him running off the court with his hands up, straight over to hug Coach K on the sidelines. What a memory. We also have to acknowledge that this was the season Allen hit the game winning shot to beat Virginia in Cameron, and everyone went wild. "That was amazing. With this being the place I wanted to play, and being able to do this in Cameron, let alone have the opportunity to; I knew my number was called for the final shot and I was just ready to take it.” Allen’s response when he was questioned by Jeff Capel about how it felt to hit the game winner in Cameron that day (check out the link below to refresh your memory). Allen was just the ninth player to lead Duke in scoring (21.6) and assists (3.5) in the same season, as well as just the eighth Duke player to average over 20 points per game. Allen also handed out more than 100 assists, with a record of 127 for the season. Those are just to name a FEW accomplishments of the sophomore career of Allen. This was the year I think everyone became extremely familiar with who Grayson Allen was whether they liked it or not, and Duke fans everywhere were loving it. Not many fans were expecting the return of Grayson after his breakout sophomore year, but fortunately we were all lucky enough to witness him return for another season. Although junior year wasn’t the best year for Grayson, we were all glad to see him stay. Learning how to deal with the hate he was receiving was obviously hard for him. He didn’t want to be known as the typical hated Duke player. Unlike past Duke players such as JJ Reddick and Christian Laettner, who soaked up every bit for motivation. 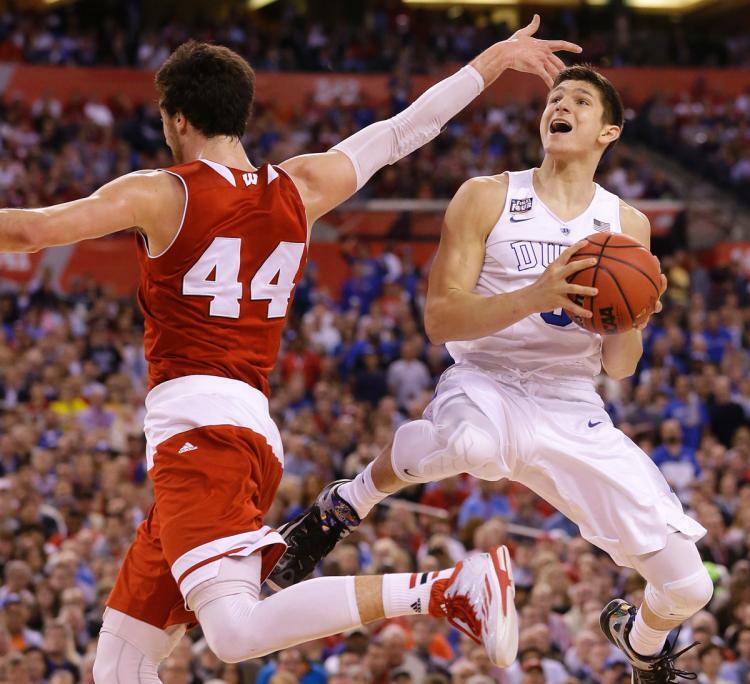 As the season went on, the booing got stronger, but so did the love from Grayson Allen fans. In the end, he has come out stronger on top in knowing who he was and not letting the negativity get to him. That’s something we all can learn from. Grayson taught us a lesson throughout his junior year. A lesson of, no matter how much your succeeding, there will always be someone trying to tear you down; key word, TRYING. Especially when you’re in the spotlight, not only as a college athlete, but as a Duke athlete. Grayson showed us that he is stronger and better than the hate and negativity, and that you can overcome any obstacles in your way. We all know how special this team was. We all got to enjoy watching them as the first team to ever win four games in a row in the ACC tournament, which led to the ACC Championship title. It was also the season Duke beat UNC two of three times, with help from G scoring 43 total between the two. Some others from G’s junior year consist of: tallied 24 points and four assists in Duke's home win over Michigan State in the ACC/Big Ten Challenge. Dished out eight assists in the win over Florida at Madison Square Garden, as part of the Jimmy V Classic. And went on to a career-high of 34 points on 12-of-16 shooting against UNLV, in the first college basketball game at T-Mobile Arena. Allen also was named an All-ACC Academic selection for the third time and snagged the Iron Duke award for the second time. Which he also went on to receive one last time his senior season. He started off his senior season with a bang. Starting at none other than Countdown to Craziness, winning the dunk contest of course! Because who else would jump over two cheerleaders to win? Not to mention when he came out to the traditional Crazies song "Every time We Touch" which pulled on a few heart strings for sure, and made pretty much everyone cry on the inside. G also brought his A-game in the match up between no.1 Duke, and no.2 team, MSU, scoring a career high of 37 points. Pics in the collage above are borrowed from Chris- Duke Report. @DukeOfHoops on twitter! The past four years watching Grayson grow into the person and player he is now has been so awesome and fun. It’s a rarity these days to witness a player of his stature stay for four years, especially at Duke. But, this is Grayson Allen we’re talking about. We as Blue Devil fans have all grown to know and love him for who he truly is. It’s clear to see that he has learned from his mistakes and is changing the way people view him, even this late in the season. I personally can vouch for him, knowing he is the opposite of how the media has portrayed him in the past. Although I have only met him once, he was one of the kindest people I’ve met at Duke. Check out the video below as Jeff Capel sits down with Grayson to discuss some highlights over the past few years, and don’t forget the tissues. 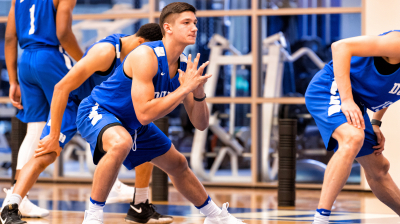 Associate Head Coach @jeffcapel got up with @graysonjallen ahead of Senior Night to discuss some of our captain's memorable moments at Duke! I remember the day his letter on “The Player’s Tribune” released about staying at Duke. I remember getting chills and having the biggest smile on my face while reading it, and how excited it made me for this season. With Grayson being the only senior on the team, he certainly had a big role to play as the leader and captain. In his article, he wrote about Quinn Cook being a big example for him and how he looked up to Quinn as his big brother on the team. He talked about how Quinn would always try to bring him out of his shell and involve him, and he would wonder why Quinn wanted anything to do with, “the freshman at the end of the bench”. In his own words, “Because of Quinn, I started talking a little more my freshman year, which was something I really didn’t like to do. And I realize now how important it was to my development. If you’re comfortable talking in the locker room and on the team bus, you’ll feel comfortable talking when you’re on the floor. That can only help the team.” We can all see these aspects now from Grayson this season, communicating out on the court during games, it has really helped the team. He is one of those players that can just go out there and bring so much energy and point production to the team. Amile Jefferson was another great leader who I feel probably helped mold Grayson into the captain he is today. And just like Grayson, both Quinn and Amile have had to grow into the leaders they were. Grayson’s hard work and dedication have shown him worthy of the lone senior captain role this season. Grayson, I just want to say thank you for an incredible four years at Duke. Your time at Duke has truly been admired by us all. Your humbleness and hard work ethic has inspired me to be a better person. You have brought myself, and many others wonderful joy and great memories that we’ll never forget. Especially the time I met you. It was after knockout Harvey, everyone had left. It was my little sisters first time at Duke/Cameron Indoor so after the event we had taken her into the museum, (which wasn’t even open) one of the staff members so kindly let us go inside. As we were heading out for the day we were just so thrilled to have met a few of the current and past team members, Gary Trent Jr., Wendell, Jordan Tucker, Marques, Justise (insert heart eye emoji), etc. But, the one person we wanted to meet was you. My little sister Elizabeth is probably your number one fan. She talks about you nonstop, she has your jersey, even a shirt that says, “I love Grayson Allen”, which she was wearing that day (and the biggest printed version available of the picture you two took that day on her wall now). Long story short, we were leaving a little bummed because we hadn’t met you and knew we probably wouldn’t get that chance again. As we started walking to the car, we got a glimpse of you and Vrank walking out of the back of Cameron. I instantly jetted after you like the crazy fan girl I am, because I wasn’t about to let my last chance of meeting you be ruined. Once I got close I stopped running because I was scared it might make you run away, so I composed myself. Unlike my sister, who basically attacked you with a big hug. She was so ecstatic that she had no idea what to even say to you. I thought she was going to pass out when you complimented her shirt, it made my heart so so happy. We both will never forget that moment, and how nice you were to us for stopping at the end of your hectic day (basically in the woods of Duke) to take a few more pictures. I simply want to say thank you, and I wish you nothing but the best in your future. You’ll always be one of my favorite Duke basketball players. Take a look at what some of your other biggest fans have to say about your last four years at Duke (click the photo for message). First off I want to say thank you. Thank you for being a loyal hard working player who never gives up. Thank you for creating a spark in my life. That spark was Duke Basketball. I know from the first day I saw your high school mixtape you were going to be special. In 2014 my buddy Mason taught me about the brotherhood and we watched every game that year. I have never been so emotionally invested in a team that I don’t play for EVER. You got me into loving Duke and loving college basketball. I can’t thank you enough for that. On to the National championship, I tell everyone that we wouldn’t have won that game if it wasn’t for your fire. You were the MVP in my book. You had so much heart and so much fire coming off the bench. From then on I was 100% sure that you were going to be special. To your sophomore year, that year in my book was your best year because you took over that “leader role” didn’t have the best team in the nation but you grew as a player and as a person. When I was playing college basketball in Illinois, I was basing my game off you. I wanted to be more confident with the ball in my hands, I wanted to be more athletic, faster, stronger, and smarter. Watching you every game day helped me on the court a crazy amount. I will NEVER forget the day when you hit the game winner at Cameron against Virginia. Wow, I was screaming and jumping up and down like crazy. When I got that notification on my phone saying that you were going to come back for your Junior year, I was Ecstatic. Your Junior year wasn’t the best year BUT it definitely made you into the man and the competitor you are today. I believe that all the booing you get and all the hate just fires you up even more, something inside you starts to turn on all cylinders and you just go nutty. Even though your junior year didn’t go the way as planned your decision to come back for your senior year got me HYPE. WOW, WHAT A DAY THAT WAS. Not a lot of guys stay to there senior year, but you did. You are special. Funny story, I was walking around Duke one day and ran into Sam and she told me you guys were about to eat so I stuck around outside the dining room you guys eat at and I was going to wait for you to come up the elevator so I could get a picture. So you came up and you were with Vrank and you guys were having a conversation so I just said whats up and thats it LOL I froze so bad but it was really nice to see where to GOAT walks around and does his thing. I was in Chicago for the game against MSU and jeez I am so happy to have seen your greatest college game of your career live in action. What a game and what a leader you are. You are what Duke needed this year. Im writing this 4 days before the UNC game at Cameron. You guys can be special this year. with your leadership and drive I know you guys will make a push. To finish things off, I wanna say thank you again for being such a loyal player and thank you for helping me with my game and my life. Believe it or not you made me a better person. I have followed you for 5 years and I am so happy to call you one of 2 of my favorite players in the game EVER. I am proud to be a fan of Duke. I am a proud fan of Grayson Allen. I even wear your jersey every gameday and I will for years to come. Thank you for everything you have done here at Duke and thank you for being the person you are. You have a lot of good things coming your way and you will ALWAYS have one fan who has your back. I could literally go on for days about you and your career at Duke. I can’t thank you enough. Good luck in the ACC Tourney and PLEASE BRING HOME THAT 6TH RING. I cannot thank you enough for all the joy you’ve brought me the last 4 years. You’re a tremendous competitor, athlete, basketball player, and more importantly, a tremendous human. I have loved following you, since I first heard about you. It is very hard for me to pick just 1 favorite memory of you, since there are so many great ones. I could start with the first time you checked into a game at Duke, or all of your highlight plays from the National Championship game. Another favorite memory of mine was your sophomore year at UNC when you ran off the court with your arms up, victoriously. But none will ever compare to seeing you play live in Chicago, twice. Being able to shake your hand both times before the game was very special to me. But my favorite part of all of it was seeing you dominate MSU and scoring 37points, in person. I am upset it is all coming to an end, but I can’t wait for the NCAA tourney, and I can’t wait to follow you in the NBA. It seems like just yesterday that you commited to Duke. I remember knowing you would be special when I saw you compete in the dunk contest at Countdown to Craziness as a freshman. I will never forget you going off in the National Championship game and giving that team the energy they needed to finish off Wisconsin. I remember the buzzer beater against uva. I jumped up and grabbed my son and began jumping with him in my arms after you hit that shot. Since that moment, he requests to wear his Grayson jersey to school. Yes, you are on a first name basis in my household. Thank you for being a strong leader and you will be missed. I look forward to seeing 3 in the rafters. Who knew that 4 years would go by so fast! When I met you at the Beach Ball Classic and then you threw on the Duke jersey to win the dunk contest - you instantly became my favorite Blue Devil of all time. (Sorry Quinn). It’s been wonderful watching you grow over your career at Duke and I just want to thank you personally for all of the excitement and memories you’ve given me. Keep grinding and lead this squad to #6! God Bless! Your passion, intensity, and love for Duke basketball will never be forgotten...Thank you for a very special 4 years! Bro it’s been an awesome four years. It’s so rare now for someone with your level of talent and athleticism to stay around for the whole show. (Philippians 1:6) We’re so glad you did. What is even better than that, is that you are blatantly unashamed of the Gospel of Jesus Christ (Romans 1:16). Keep doing you man. Our family will continue to pray for you. And since I’m also a huge Celtic’s fan, one of those prayers is that you wind up playing with Kyrie and JTat. Lol. Keep doing you GA. God bless.